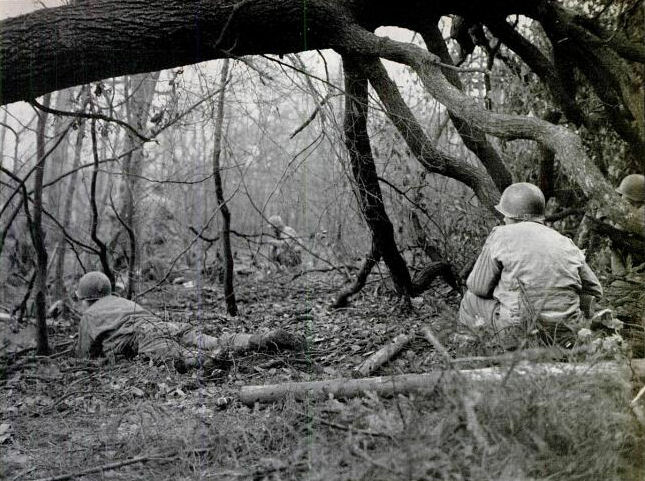 a little band of U.S. infantrymen hears German shells crashing down in the woods nearby. Five miles southeast of Aachen is the Hürtgen Forest, 50 square miles of tall firs and Siegfried line pill-boxes. In September U.S. troops went into the forest and after ten weeks of eerie, murderous fighting, they came out of it. 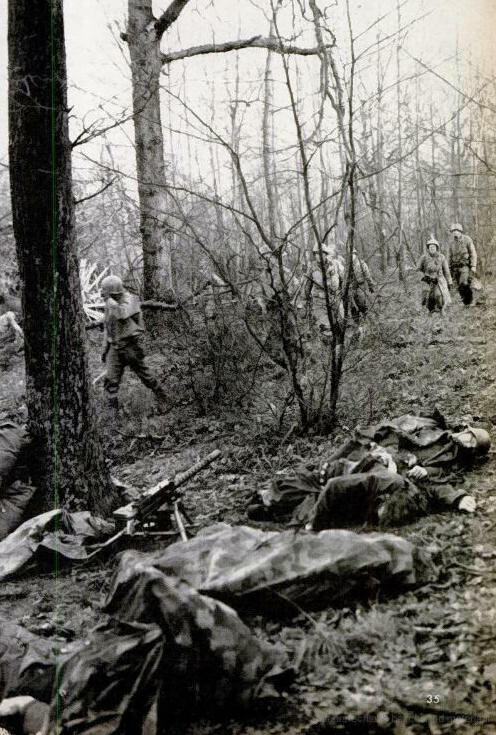 Last week the German counteroffensive threatened to outflank the Americans holding the forest but, told by "Time" and LIFE William Walton, it could not efface the story of courageous men who took it. The sergeant named Garcia couldn't believe his eyes when he saw six American engineers warily working their way across the flat, unfenced fields into Grosshau. Garcia knew that Grosshau was still very much in German hands. As he watched in the cold gray afternoon from his shell crater he saw happen just what he knew would happen. The Germans burrowed into the cellars of the ruined village, let the engineers creep 100 yards past the first house, then opened fire from all sides. The engineers disappeared in a burst of flame, either dead or prisoners. Nobody could find out who had given the engineers orders to enter Grosshau. One of those snafus which are part of any battle. Neither could anyone find out, after the battle of Hürtgen Forest had ended, just exactly what Sergeant Garcia had done then. All they knew was that Garcia and a half dozen other gunners had left skeleton crews at their antitank guns a quarter of a mile up the road from Grosshau. Then they crawled down into the village outskirts, killed the Germans in the nearest cellars, recaptured the engineers and crawled back with them to the American lines. Garcia was wounded. So nobody could get a detailed account from him before he was carried back to a clearing station. Not even his first name. Somebody remembered he had just got American citizenship a year ago. That was all. The regimental colonel when he heard about it said, "That man is going to get the best medal I can give him. Somebody must find out all the details." But the fight for Grosshau and the last dank patches of Hürtgen Forest were still too hot just then for any careful research, and Garcia's feat had been only a little more heroic than those of hundreds of other men who in the tumult and confusion had been daring and courageous and resourceful. Most of their braveries never would be known, except to the few who witnessed them, just as no man would ever know all that had happened in the battle of the Hürtgen Forest. Hürtgen Forest is a name to carve some day on the war memorials of America beneath such evocative place names as Château-Thierry, the Argonne forest and the Wilderness of the Civil War. 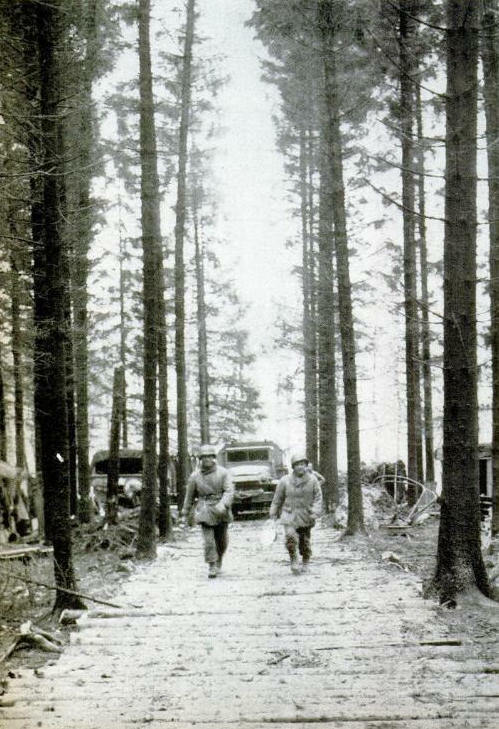 Other battles in this war have been more dramatically decisive — Normandy, St. Lô, the Falaise pocket — but none was tougher or bloodier than the battle for this Hürtgen Forest. Close-ranked firs towering 75 to 100 feet make the Hürtgen Forest a gloomy, mysterious world where the brightness of noon is muted to an eerie twilight filtering through dark trees onto spongy brown needles and rotting logs. Occasionally a neat ditch to control forest fires slices through the overgrowth. A few woodchoppers' huts such as old Germanic folk tales describe are hidden - among the trees. On the western fringe four villages — Rott, Zweifall, Vicht and Schevenhütte —fill small clearings. Otherwise the Hürtgenwald is a fathomless sea of darkness, somber enough in peacetime, in wartime sinister with lurking enemies, evil with whining bullets and bursting shells that leave broken trees and broken men in tangled fraternity. 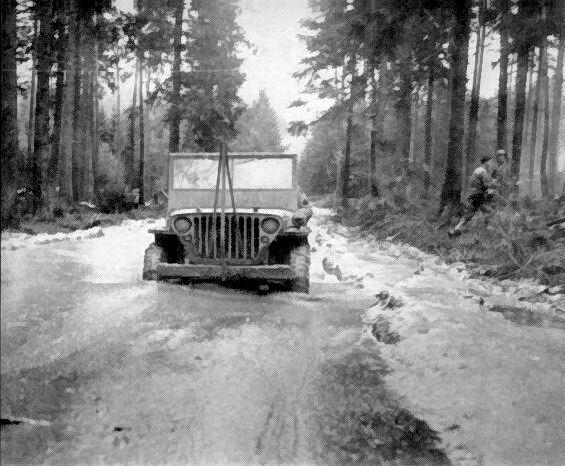 A river of mud on a road slows a jeep pushing through the tall evergreens of western Germany. One big obstacle to the slow U.S. push eastward through the Hurtgen Forest was the fact that the roads ran north and south. New roads had to be cut through the trees and paved with logs (below) so trucks could move up. American troops had been in the forest since mid-September when the 1st, 4th and 9th Divisions overran the Siegfried defenses with the momentum gained through France and Belgium. Two Hürtgen villages, Zweifall and Schevenhütte, fell before over taut supply lines pulled the First U. S. Army up short. Not until mid-November could the starting signal be given again. By Nov. 16, the 9th Division had been withdrawn from its dug-in Hürtgenwald positions and the 4th Division, first ashore in Normandy, substituted to spearhead the attack. The 4th's commander, Major General R. O. Barton, sent his 12th Regiment in on the left when the offensive started. Two days later the 22nd Regiment was committed in the center, then the 8th Regiment, on the right. The Germans brought to bear artillery and mortars in concentrations such as had not been heard or felt previously on the Western Front. Pine needles hid vicious Teller mines, box mines and the new shoe mines which blew unwary patrols up into branches minus a foot or a leg or a life. The 12th Regiment, under hoarse-voiced Colonel Bob Chance, worked foot by foot up a forested slope with two companies, F and G, driving a wedge into the German lines, a wedge that threatened the German positions but also exposed the two companies' flanks. The German mortars, wise to the terrain, cracked into F and G Companies, bursting in the trees to shower jagged fragments for yards around. Machine guns ripped the gloom and rifles crackled as the Germans gave a little ground but only a little. Seeing the two companies worm into their lines, the Germans waited. Then they threw in concentrated mortar fire and under its protection struck down a ravine and up the other side to cut the slim supply line. F and G Companies were trapped. For two days and nights the Germans poured mortar and artillery shells into the narrow area where infantrymen back to back were fighting off the German attacks. One slender footpath brought a trickle of ammunition but no food or water. The path was under such constant fire that the wounded could not be evacuated. Rain drizzled through the darkness, trickling into foxholes and seeping through winter clothing. Medical supplies were insufficient to care for men with jagged leg wounds, with bleeding chests, missing fingers, blood- and rain-soaked bandages. E Company, nearest to their surrounded comrades, tried desperately to relieve them. On the third day Colonel Chance moved up A and C Companies in the darkness, sent them in to attack at daylight. The Germans, caught between the isolated companies and their relief, were slaughtered. On both sides there was daughter but F and G Companies had been saved. That was how every foot of the Hürtgen Forest was to be. Then it snowed. A wet, suffocating blanket sifted through the trees, weighting heavy-branched firs, covering foxholes and shell craters, mantling sentries who stomped at their posts and patrols creeping under low boughs. The few roads, already pale brown rivers, remained quagmires that sucked down ' tanks, trucks and jeeps struggling toward the front. Now the focus of battle shifted to the 22nd Regiment whose commander, Colonel Buck Lanham, could see light ahead through the trees. His battalions were spread like two fans on either side of the ravine. Muddy trails from the rear brought up replacements to fill out his riddled lines, fresh-faced second lieutenants still untried by enemy fire, privates in clean overcoats standing in the trucks with grave expressions, not scared but very serious as the sound of shelling echoed through the trees. In his wooden trailer Colonel Lanham was talking on a field phone: "Tell C Company to get in there with bazookas and grenades and take that high ground. Hill 90. We've got to have that high ground. Hill 92 doesn't do us any good until we've gotten 90, too. And Blue can't advance until the Krauts are knocked off those hills. Tell them to fight like hell." He hung up and turned tensely to the map on his small folding table. Prematurely gray, with black eyes bright behind his spectacles, the colonel seemed too absorbed in the map's crayon hieroglyphics to notice the stocky, wide-faced captain waiting across the table. Without looking up he said, "You didn't know it was me you had on the phone last night, did you, Swede?" "No, sir," said the captain, shifting nervously. When the colonel looked up he smiled. Swede smiled too, with relief. "That's all right, Swede," the colonel said in a voice softened by understanding. "I know how it is when you see a lot of your friends knocked off. But you've got to treat your superior officers with more respect." Swede was silent a moment, then he said quietly. "Colonel, sir, I don't care if you break me for it. I meant what I said last night, even though I didn't know it was you on the line. That little patch of woods we're fighting for ain't any good to anybody. No good to the Germans. No good to us. It's the bloodiest damn ground in all Europe and you make us keep fighting for it. That ain't right." Now it was the colonel's time to be silent. Two men sitting across the table looking at one another in silence. The colonel, slight of build, keen-faced, intense. The blond captain, bulky, mud-spattered, a two-day growth of beard on his wide face, a face designed for grinning but dead serious now and pale with fatigue. 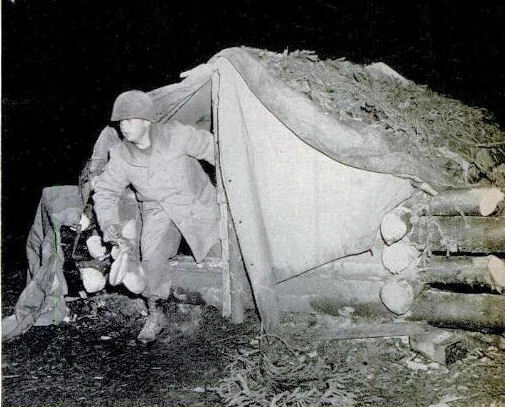 Log huts and other rude comforts were set up by the men when fighting in the forest died down. Below is evidence of one of the deadly little fights which went on even in quiet periods. Americans advance past the bodies of four Germans killed by a single grenade while they were firing a captured U.S. machine gun. "There's nothing in the world," said the colonel deliberately, "that I'd like to do better than tell all you boys to call it off and go home. You know that, Swede. But it can't be done. The only way we can get this thing over is by killing Krauts. "To kill them you've got to get to them." "Look here on the map. You know they're dug in all through this woods you're talking about. Once we've got those two hills then we'll he able to pour so much stuff into that patch of woods that not a Kraut will be left. Then we can push on to where the woods end and fight in daylight like little gentlemen again. Wherever there are Krauts we've got to kill 'em. I know they've killed lots of our boys in that patch, but we've killed even more of them and that's what counts." Swede sighed. "I know you're right, Colonel. Knew it all the time. I just have to get things off my chest once in a while." " Pour yourself a slug of good Heinie cognac," said the colonel. When Swede left he was smiling again. The phone buzzed.
" Charcoal speaking," said the colonel. "Yes, wild man. Got up on top the hill, did they? That's the stuff. Keep 'em going and let me know so we can start concentrating on that wooded patch." No sooner had he hung up on his G-2 officer than the phone buzzed again. "Charcoal speaking. Oh, hello, General. Yes, Blue is going to jump off soon. Just as soon as Hill 90 is cleared. Yes, sir. That's right. You can count on us but I wish you'd get that damn task-force armor to start moving south of us. You know how armor is, wants every foxhole cleared out before they'll move . . . . Well I suppose so . . . . Yes, sir." During the dreary afternoon Lanham's C Company fought up to the top of Hill 90 and started firing down into German positions before the early winter twilight made them button up for the night. A colorless dawn brought more artillery, but by 8 o'clock the gray sky had broken sufficiently for fighter-bombers to lay on a mission. Tobogganing out of the western sky they came down over Grosshau, the tiny village just beyond the eastern edge of the forest. Each cracking explosion fountained smoke and debris into the still air. In foxholes scooped from rotting pine needles the foot soldiers watched approvingly. "Give it to the bastards." "Lookit those houses go whammo." In the thunder heaped on Grosshau it seemed impossible for any living thing to survive. Cautiously riflemen and Tommy gunners hunched down the hill from tree, to tree, firing whenever a shadow moved unnaturally in the woods ahead. Now they were fighting in Swede's bloody patch of woods, where every tree was shattered into a naked spear of white ugliness against the dark earth, where weather-soaked corpses had lain so long the stench was unbearable. As the day advanced the dirty brown uniforms drove the dirty gray uniforms out of the last woodland west of Grosshau. Emerging onto treeless ground, the Americans felt as naked as stripteasers at a Sunday-school picnic. The forest which had been hateful seemed friendly and protective now that they had only tiny hillocks and shell craters to shield them. Artillery hidden in the woods across the barren plain intensified their thunder when the Americans appeared. From crater to crater Lanham's men dodged, fired over rims, ducked to another crater farther ahead. From Grosshau, which had seemed completely uninhabitable, the machine-gun and small-arms fire grew intense. Time after time the 22nd pushed forward, stumbled, took cover. Six Sherman tanks were knocked out. The lines regrouped to try again. But too many men were falling. The plague of shells grew even thicker. Back in the forest a major talked to Colonel Lanham by phone. When the major had explained, Lanham said, "All right. Have your boys dig into the best portions possible. Just hold on. We'll have to try it another way." The other way was to keep to the woods and circle northward around Grosshau and the plain. Already Major George Goforth's battalion was pushing over a series of wooded hills that bulged like a ripple of muscle along the forest rim. That was on Monday, the 17th. For two days they fought trough those hills, with casualties bad on both sides. In his gloomy CP, a lantern-lit fog dugout, Major Goforth talked over the situation with his exec, Swede Henley. A company commander had just come in to report. "We're hunting for officers," said the new arrival, slumping onto a battered tin water can. "G Company's got only two officers, left. Lost three this afternoon. We can't go on like this, Major." Goforth shook his head. "I know, boy, but where am I going to get them? Division says we can commission any good man right here in the field. But who? ' He looked around a circle of dirty, unshaven faces watching him in the sputtering light, faces drained of color like those of drowned men. "Can't spare him. Practically runs G-2." "He's the last available sergeant. We've already commissioned six." "Guess we'll have to depend on replacements," said Goforth. "The trouble with replacements is that they don't last long enough," observed the company commander. "Trucks brought up 30 for me this morning; 18 were hit even before they could get into the line. No percentage in that." As he spoke the blanket covering the dugout doorway was pushed aside and three young lieutenants entered, saluted and said they were reporting for duty.
" There you are, Jack," said Goforth. "Replacements for you. Take 'em with you when you go back." Bone-weary Americans who fought in one of the forest battles eat their first hot meal in 15 days. The objective of these men was the town of Hürtgen, named for the forest, taken in November. 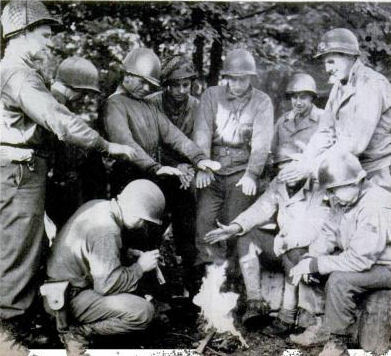 Below: men with the unmuddied uniforms and clean-shaven faces of replacements warm their hands over a fire in the woods. Somehow all that day and the next Goforth's battalion, despite its losses, managed to hump over the wooded hills, edging closer to the road connecting Grosshau with Gey. Another battalion just held onto their positions a little way outside the forest facing Grosshau, taking losses from artillery, too, but hanging on. The second day was when Sergeant Garcia charged into Grosshau and rescued six engineers. During the night an order came down from higher headquarters that Grosshau must be taken next day, the 19th. Maybe something in the big picture made it necessary. Nobody knew. But those were the orders, meaning frontal assault on Grosshau. Wearily the preparations were made. At 0900 under a low gray sky the first infantrymen raised themselves from their shell holes into machine-gun fire that spurted from the ruined village. Behind them came two M-10 tank destroyers, mounting three-inch guns. The tank destroyers rolled ahead where infantry could not make it through gusts of bullets, rolled near enough to German positions to silence their guns, then on to the outskirts of the village. Ducking low, riflemen advanced 200 yards behind them, using what cover there was, firing toward the village ruins. When the tank destroyers had rumbled beyond four houses and a jagged fragment of a church, the first break came. Fifty Germans bleary and dust-covered, scrambled from cellars shouting, "Kamerad" above the noise of battle. Platoon Sgt. Stanley Ward from an M-10 turret waved them back toward the infantry. Then it was a slow, house-to-house fight, warily spraying every doorway and shed with gunfire, hurling grenades into each cellar opening, herding prisoners down the one muddy street strewn with dead men and horses, timbers bricks and dirty straw. Neither side was shelling Grosshau, but shells were scraping overhead toward rear road junctions and supply depots. In three hours the worst of the fight was over. A few snipers lurked in among the ruins but the muddy Americans were able to push beyond the village, set up mortars and to start attacking German entrenchments in the open field. Grosshau was ours. Between the edge of the woods and the village 250 Americans had died. While the fight for Grosshau was at its bitter height, Major Goforth's battalion had crossed the Gey road and pushed over more hills. To the south Kleinhau and Hürtgen, two other villages, had fallen. 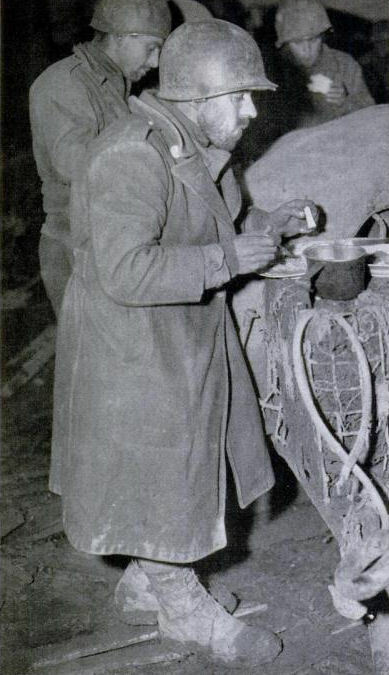 Twice the Germans threw violent counter-attacks against Goforth's men, but using bis reserves and cooks, guards and engineers from Colonel Lanham's headquarters, the counter-attacks were stayed. The battle of the Hürtgen had drawn to its end.